Rototillers and two-wheeled tractors are commonly used on small farms and gardens. They vary in size from small walk-behind models to larger units capable of carrying carts with operators. While these units are typically smaller and functionally different than the equipment used on large farms with greater acreages, they can still be hazardous to operators and bystanders. 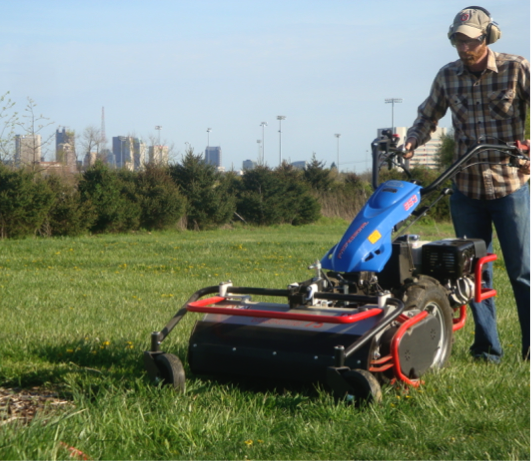 In addition to the common task of tilling, some of these machines are capable of performing many more tasks with attachments such as brushcutters, sickle bars, flail mowers, balers and many more. These machines pack a lot of power in a small package and are more than capable of causing injury or death. By following basic safety precautions, they can be operated safely with the chance of injury greatly reduced. 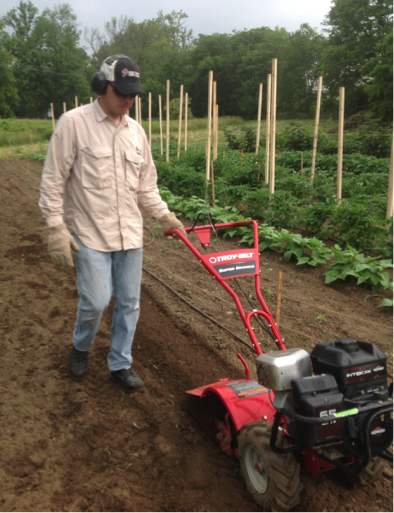 Rototiller and two-wheeled tractor safety relies on the operator being aware of the proper use and inherent dangers associated with the task being performed. 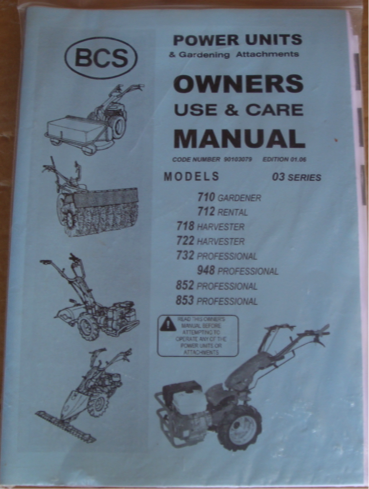 Always read and follow the manufacturer provided operator’s manual before using the equipment and any attachments. Although many units appear similar, there may be safety and operation features unique to each brand or manufacturer. If the operator’s manual cannot be found, obtain a replacement by contacting the equipment manufacturer or a local dealer. • Become familiar with proper equipment operation including starting, stopping and engaging any attachments. • Inspect the unit and the attachments for signs of wear and damage. • Make sure belts, shafts and connections are properly tensioned or tightened. • Verify that the shields and guards are in place, and that the safety features are not overridden. • Place the equipment in neutral, and disengage the implements before starting. • Do not operate equipment in a closed building, as poisonous gases (carbon monoxide) can build up quickly. • Operate the unit only on stable ground or footing to avoid potential slips and falls. • Do not disable safety features such as auto-clutches and shut-off switches, and do not secure levers and switches in the “on” position to simulate operator presence. • Inspect the area where the equipment will be used, and remove all stones, sticks, wires or other debris. • Keep the hands and feet away from moving parts. • Work slowly when tilling, and avoid forcing the unit through the soil. • Use the attachments only as they were designed to be operated. • Be aware of bystanders in the event of thrown objects, and keep a safe distance. Keep the equipment and all attachments in good repair. Use the maintenance schedule provided in the operator’s manual, which is the best source of information regarding equipment maintenance. Proper maintenance will increase the life of the equipment and decrease the likelihood of safety risks due to equipment malfunction. Well-maintained equipment will result in less strain on the equipment and operator, and will allow tasks to be performed more efficiently. • Maintain the cutting edges on blades (not required on tiller tines). • Replace the tiller tines when they are excessively worn or damaged. • Properly tension or tighten all belts, drive shafts and connections. • Inspect, adjust or replace all guards and safety features. • Wear safety glasses with side shields or goggles to protect the face and eyes from flying debris when using cutting attachments. • Wear ear protection to preserve hearing and protect the ears from the high level of noise produced by the engine and attachments. • Wear leather gloves to protect the hands from cuts, splinters, abrasions and contact with sharp cutting edges. • Wear safety boots or hard-soled shoes to protect the ankles and feet from the rotating tiller tines. Steel-toed boots help provide additional protection. • Do not wear loose or ragged clothing. Dangling or frayed edges can get caught in moving parts. • University of Minnesota On-Farm GAPs Food Safety Team. Small Farm Safety Series: Rototiller Safety. MN: Minnesota Fruit and Vegetable Grower Association, 2012. safety.cfans.umn.edu/files/2012/10/tiller-safetyPDFENGLISHfinal.pdf. • Troy-Bilt. Garden Tiller Safety Tips. Last modified 2015. troybilt.com/webapp/wcs/stores/servlet/KnowledgeCenterArticleView?storeId=10001&catalogId=14102&pageName=en_US/knowledgeCenter/knowledgeCenterArticles/GardenTillerSafetyTips.html.